I am making progress. 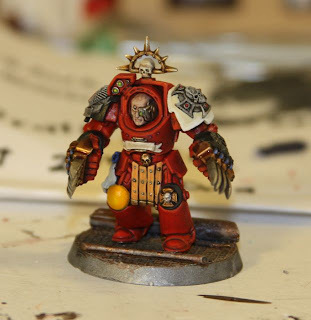 I have completed the champion, and have only detailing to do on the sanguinary priest. I tried two different techniques creating the power swords, and am not sure which one I like more. The champion has a gradual build of of lighting like lines, while the priest has wet blending verging on dry brushing. I feel like power weapons are things that I have copped out on when painting in the past, so hopefully these make the grade. I decided to grab the banner guard and do a little bit of updating on him as well. I tried to smooth out the blending on his armor, as well as clean up the tabard. I am not thrilled with him, but I think I will finish his 4 companions before I decide what to do next. 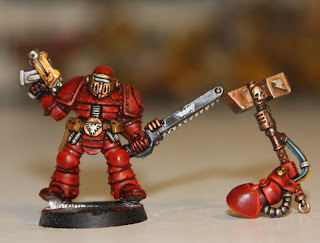 I have been thinking about putting green tyrannid bits and iconography on the Blood Angles, sort of like the Ultras. 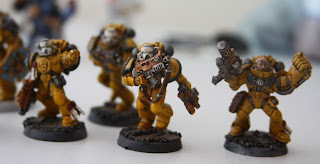 If 950 of their battle brothers were wiped out on a Space Hulk, they might be out for revenge. I haven't batch painted in a while, and I think it is really hurting my speed. I want to get this honor guard done so I have a full unit ready to field, even though I have only used them once. 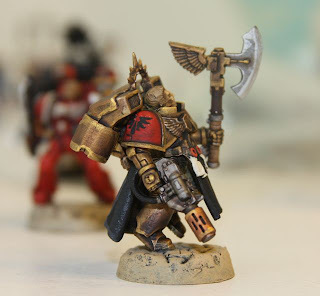 I suppose they are acting as terminator surrogates, while I work out this new extra gold, personal heraldry thing GW has let loose on the BA. 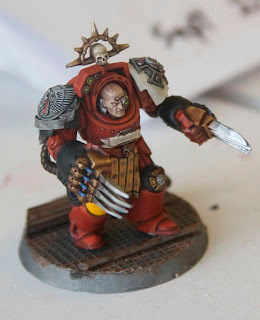 While getting ready to do the genestealer tutorial, I decided to pull out an old vanguard mini that I had planned to be part of Dante's honor guard. Back when I first started this guy I did not bother with cleaning the flash or mold lines, so it has been a bear to work with. However, I had so much fun playing with anyas' blending technique that I ended up with something that I liked.....and then mitheral silver happened. I must have had a dab of it on my finger, because I just covered this guy in silver fingerprints. I tried to salvage the mini by scrubbing the silver off with a wet brush, which worked to some degree. Now my painting stride is broken, and I must go be zen for a while doing something else. 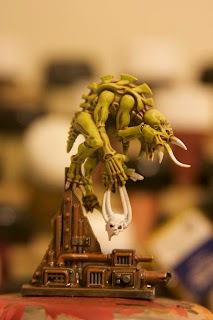 I won a painting competition for best gene stealer at the GW shop today! 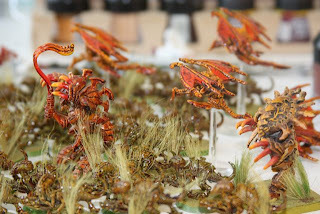 We had about two dozen models in the competition, which was a very good turn out. The rules for what to paint were a little confusing, though at least this time I did not show up a day late. 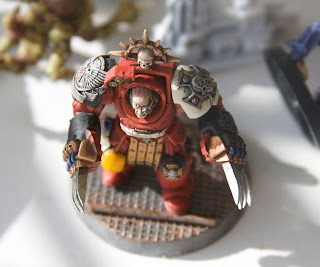 Two of us made the mistake of thinking that since it was a Space Hulk painting competition that we had to paint space hulk miniatures--this kind of logical thinking has cost us both before. I think I might just pull all the stops on the next painting competition and convert as much as I like. I won a box of gene stealers which were promptly traded away for the winners assault marines. I am very happy that the store is getting more competition, even though the terminator that took ~12 hours to paint lost and the 25 minute gene stealer won. I tried to encourage the older painters to join me in our own painting competition, but I think we would need to arrange it through the store. There was a very nicely painted dead Terminator, Librarian, and the overall winner Typhus. 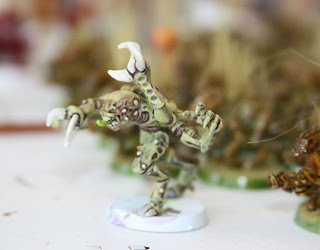 I guess I need to consider painting the rest of my bugs! 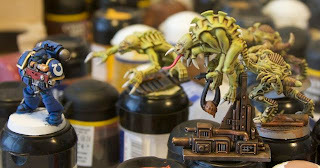 I'll post a step by step for the gene stealer so everyone can see how it was done. So I tried a white primer followed by a wash of black as my base coat on this miniature. I think there really is something to using grey primer. I read on another blog about it and had to give it a try, and the results surprised me. It was far easier to paint light and dark colors, so I did not have to make the devils bargain that comes with either black or white primer. 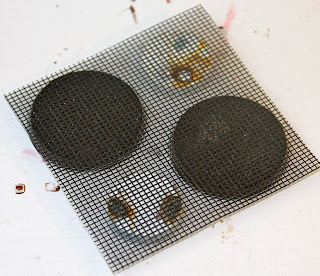 I think I may use two washed on the next miniature in order to ensure all of the recesses are evenly covered. I also discovered how how it is to pain gems. I could not even see the purple I was painting, when it was over a black or red under coat. 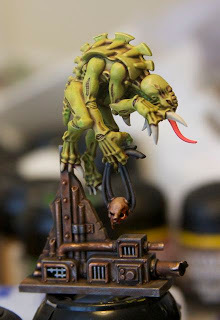 I have some touch up work to do on this mini, and then I will post a step by step for my gene stealer color scheme. 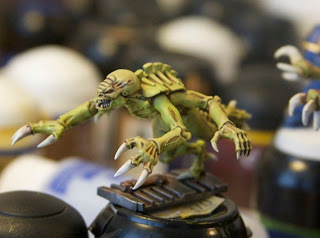 It takes about 15 minutes to paint a gene stealer this way, and I am really happy with the way they turn out. Trying a new technique out on the next terminator. When I polished this guy off I stumbled upon a blog that suggested grey primer. Lacking grey primer, I made due with GW white primer and heavy badab black wash. We shall see which technique rules supreme! 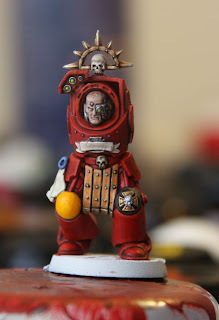 I love the new gene stealer holding the decapitated head of some adeptus mechanicus. It is one of the most fun miniatures I have painted in a long time. 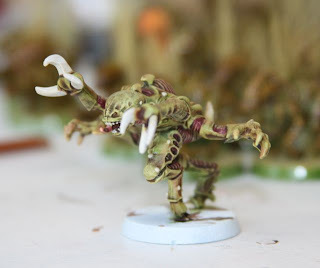 I like it so much I have been comparing it to the old gene stealers and wondering what happened to all of the little boney knobs and things that were part of the old model. 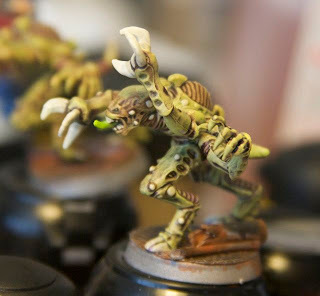 I may consider some green stuff boney additions to my new stealers, as a way to add the little bit of detail that missed the model. It makes me think about the original models. The original models are very old now, but they have a timeless look that keeps them from being relegated to the back shelf. 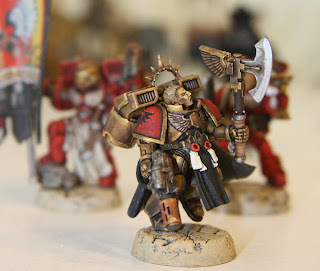 Compare that model, decades old to the space marine in the new set. I am not sure the marine is as timeless. I was reading another blog last night and realized that I had never painted an ultra marine. 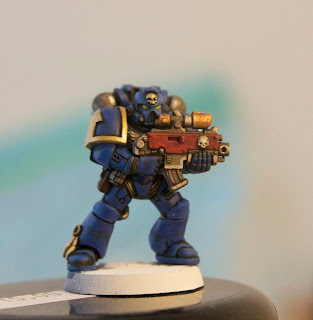 I happened to have a pot of ultra blue, a partially completed Angel's Tempest marine, and an hour to kill. So here he is, my first ultra. My normal method of painting is simple layering followed by really controlled dry brushing. 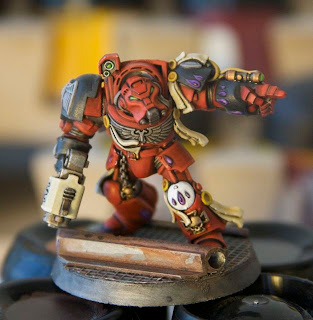 Since Space Hulk came out I have been trying to use layering alone. 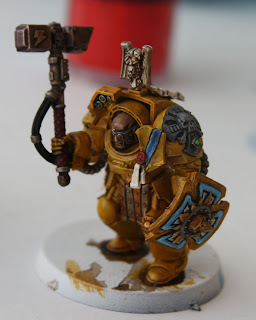 I am not convinced the technique works for me, however I have not painted enough to really have learned it yet, so you expect more random chapters painted using techniques new to me. I am really having a blast painting these gene stealers. The base is wet in this photo. I'll post another one when it dries. 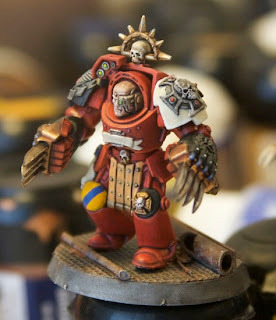 This miniature is one of the coolest poses ever. 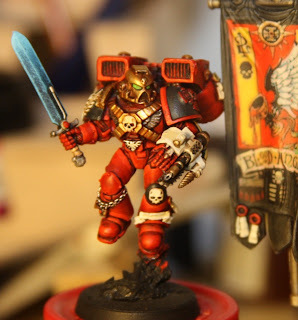 I find myself posing it behind the blood angel I just painted. 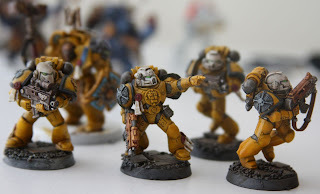 Is it weird to want to wait to play the game until the minis are painted? 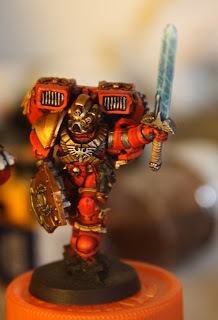 This is the terminator I have been practicing on for a while. I had some badly primed lightning claws and forge world shoulder pads, so I thought I should give it a go. 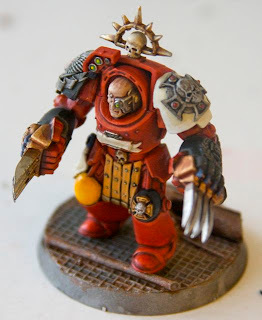 Besides, I am one step closer to having two legal squads when I add him to the Space Hulk set. With the exception of the arms, I have tried to keep the paint very smooth. Overall, I think it is an interesting technique. It takes hours longer than just dry brushing. The next terminator will have a darker initial wash, so there is greater tonal variety. I still have a bit left to paint on this guy. I need to add his heraldry to his yellow knee pad (probably something blue), as well as the lightening claw wires. So what you do think about adding battle damage? I was thinking of adding damage to the black lighting claw casings, as well as some parts of his armor. 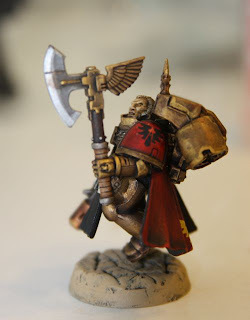 I was thinking of doing this with a dark grey/brown shadow and bolt gun metal. Any thoughts? I know there are plenty of tutorials on how to take photos of minis. I use natural light when I can, but it is gloomy here in DC, so I flash is the best I've got. I did buy some poster board to try and make a light box following one of the tutorials I found on the B&C, but that can wait till another day. I've got stuff to paint. 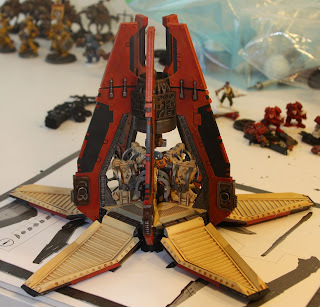 I wanted some space hulk bases, as well as a way to produce them in huge quantities quickly. 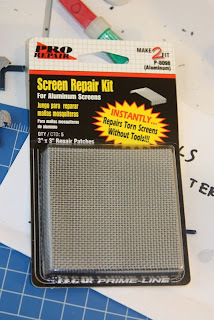 At the local hardware store I found this screen door repair kit. Turns out it was perfect. 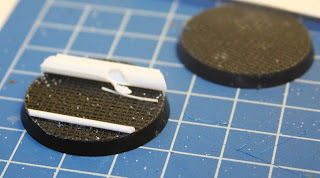 One side of the mesh is already covered with glue, so all you need to do is stick your bases to it, let it dry and then cut out the bases with a regular pair of scissors. 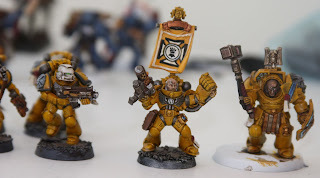 I primed the bases white, washed them with bolt gun metal, and then followed up with a black wash, and then an orange wash in some areas while the black wash was wet. As part of the Jawaballs painting contest, I have been doing a lot of test minis. 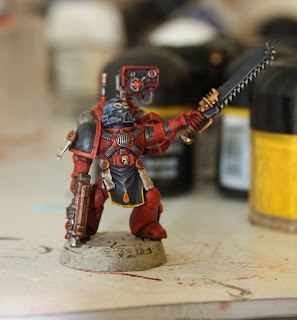 I was really happy with this terminator last night, and then decided to put on a watered down baal red wash. I don't know what I was thinking! I had spent a few hours shading the mini cleanly, why ruin it? 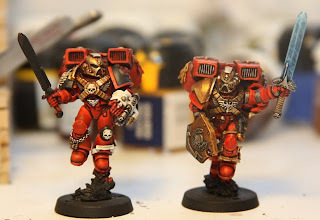 I still like the way the terminator turned out, but the baal red really toned down the highlights and demolished my mid tone. I will go back and re-highlight later today. As soon as the arms get pulled out of simple green I will be able to attach his lightening claws and forge world BA shoulder pads. 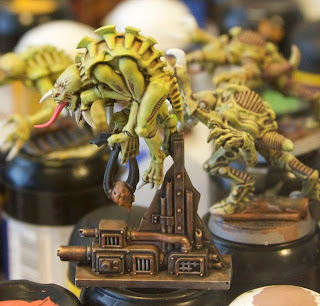 I started a tyrannid army years ago, after purchasing space crusade, and ended up with a bunch of traditionally painted tyrannic warriors and genestealers. Spin forward a dozen years and I am back to painting bugs. Space Hulk is just so amazing that I decided to do a bunch of test stealers. I found one of my old purple stealers as a reference, and then proceeded to just paint and wash the bugs as I saw fit. 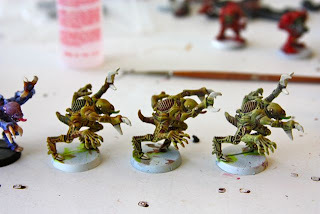 I started with striking scorpion green and then painted the soft flesh of one of them with purple, another one maroon, and left the third one green. A few washes of ogryn skin later and I have three interesting test models. I am partial to the one on the far right. I plan to start one of the real stealers today so I can enter it into the painting competition this Sunday. I am concerned that the simplest method looks the best to me. 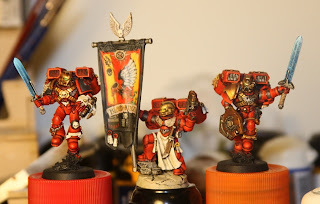 When I started painting Blood Angels it was because I wanted to play them at the store. It seemed like a far easier codex for me to deal with. The BA favor assault, which was new to me at the time. With my Iron Scythes I played a more defensive less organized game. With BA I know I need to get into close combat as quickly as possible. I have an unpainted metal Dante, but I really wanted my version to be a little bigger. 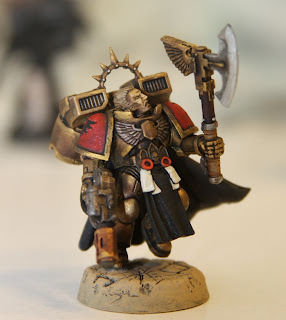 I painted this guy up for a game the next weekend, so he is not my best work. In game terms Dante has been a combat monster for me! I normally pair him with an assault squad, supported with another assault jump pack squad. Corbulo with VAS in a rhino and death company jumping along behind present my opponent with some choices. Dante's awesomeness makes up for my bad tactics! I don't normally win, but I have a lot of fun watching Dante bring slaughter foes like a true servant of the blood god. Dante deserves and update. I am working on some clear red/orange/black/brown gel to see if I can create the look of semi-dried blood spatter on him. I'll post photos if it works out. My Dante is already down and dirty. Cover him with blood and gore and think he might intimidate my opponents even more. 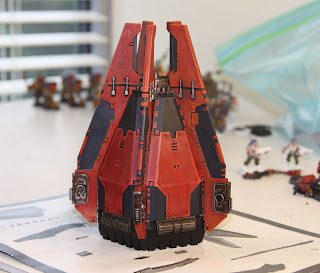 The drop pod is the beginning of a new style for my blood angles, but I think it does fit in. 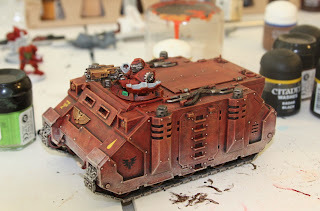 I plan to us an airbrush on my land raider, so it will look vastly different than the vehicles painted here using the huge GW drybrush. It is satisfying seeing the whole gang of vehicles together. I have one more rhino and two land raiders, so we'll have to see how my style progresses. I put in one shot of a finished devastator sergeant. I've had him partially completed in the miniature case for about a year now. I was all about speed when I started my BA, so all kinds of mold lines. I can't wait to get a photo of the whole army together. So, who in the DC area wants to do a little gaming? 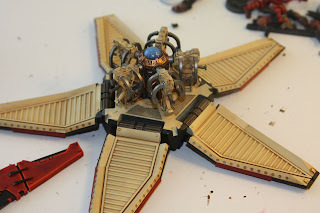 I finally dusted off the drop pod and sat down to put the thing together and paint it. I am still having a bear with red. 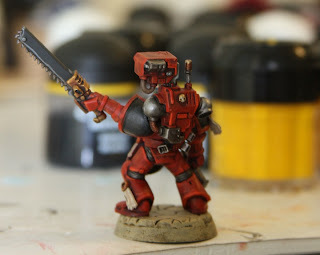 For some reason I cannot duplicate the red I painted most of my army with. I've seen smooth blended red, and the battle worn red of my early days no longer holds me. 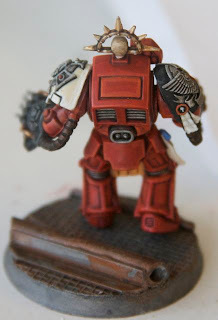 I want my terminators to look like red rock stars. 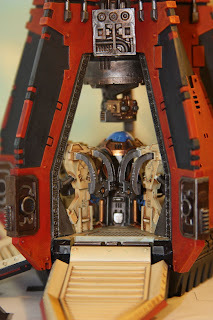 The drop pod looks kind of cool now, but was not as cool as building a tank. There is something about having to paint all the parts individually that does not give me the same satisfaction as mostly building a kit and then painting it. The pod has touch up work, a few more bits, and some washes, and it will join the ranks of my BA. So, does anyone just field one? Can I use a single drop pod? I was thinking of just putting my furioso dreadnought in it and calling it a day, but I have not ready any reports of single drop pod use. I suppose it could be used as a distraction while my jump packs and rhinos surge forward. 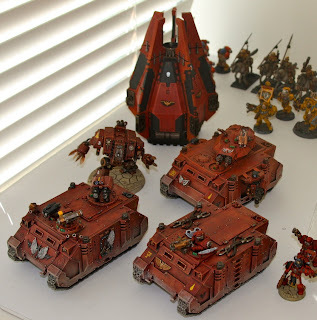 If you had the choice of a furioso in your backfield, or death company jumping forward front and center, where would you fire? 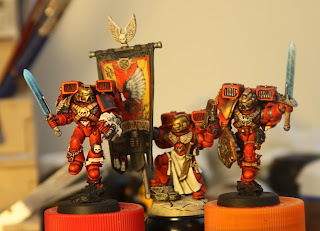 I've painted a lot of blood angels, which you can see some of in an earlier post. 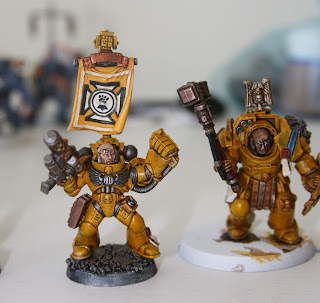 However for some reason I have a painting block when it comes to the new Space Hulk Terminators. The miniatures are so nice that I am nervous about painting them. I tried inks in a previous post and decided to give Anya's painting method as described in White Dwarf 356 a try. I am not sold on it. 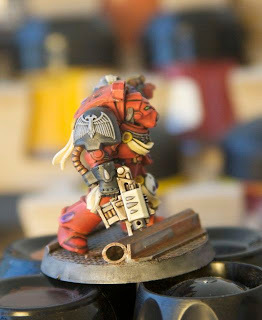 Granted I did not spend a dozen hours working on my test marine, but even with thinning I get too much paint build up. 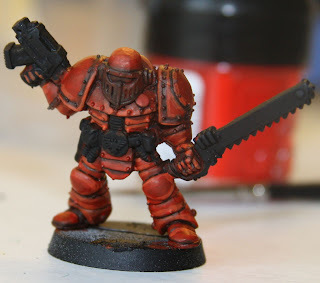 I gave the mini two washes of baal red. The first one was watered down as the article describes, the second was at full strength. 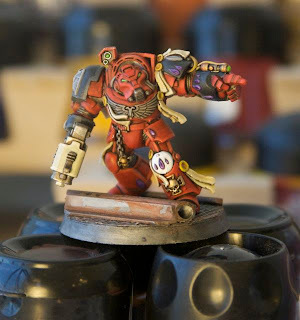 The crusade style marine is painted using Anya's method. The thunder hammer using my old method. dry brush blazing orange or just highlight. 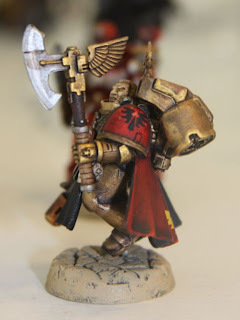 Rather than do an Iron Scythes counts as Lysander I decided to kit-bash my own Lysander and just use him with my custom chapter whenever I want his special rules. While I was at it I created 5 sterngaurd veterans to go with him. 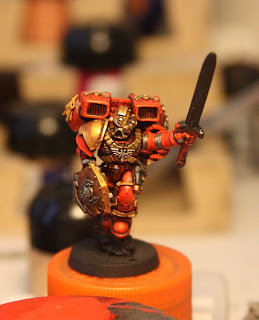 I am not terribly pleased at how Lysander himself came out, but I am really happy with some of the marines. This was my first try using GW Inks, which I found in my warhammer misc box during unpacking. I love the way the inks work on yellow. The red ink leaves a bit to be desired. 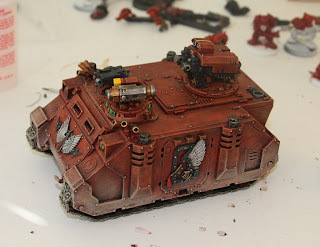 You can see a post with some orks I tested the red ink on earlier on this blog. So should I post ink tips? I am a novice with ink, but have already learned that putting too much on ruins detail.